Venn diagrams are schematic diagrams used in logic and in the branch of mathematics known as set theory to represent sets and their unions and intersections. They show all of the possible mathematical or logical relationships between sets (groups of things). The British philosopher, mathematician, and professor of logic, John Venn (1834–1923), introduced the Venn diagram in his paper, “On the Diagrammatic and Mechanical Representation of Prepositions and Reasonings,” which appeared in the Philosophical Magazine and Journal of Science in July of 1880. The simplest Venn diagrams consist of two or three intersecting closed curves, but he also gave a construction for Venn diagrams with any number of curves, where each successive curve is interweaved with previous curves, starting with the three-circle diagram. A. W. F. Edwards, Branko Grünbaum, Charles Lutwidge Dodgson (a.k.a. Lewis Carroll) developed extended implications of Venn diagrams. Simple Venn diagrams are used in the classroom to teach students logical organization of their thoughts. In 1881, Venn further elaborated on his original diagrams in Symbolic Logic (1881), and continued to improve his method for illustrating propositions by exclusive and inclusive circles. The use of geometrical representations to illustrate syllogistic logic did not originate with Venn; Gottfried Leibniz used them as well. Venn became critical of the methods used in the nineteenth century diagrams of George Boole and Augustus de Morgan, and wrote Symbolic Logic mostly to present his own interpretations and corrections of Boole’s work. 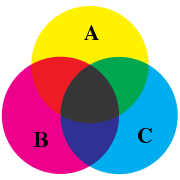 Venn's diagrams became the most important part of his work, rather than his attempt to clarify what he believed to be inconsistencies and ambiguities in Boole's logic. A stained glass window representing a Venn diagram in Gonville and Caius College, Cambridge, where Venn studied and spent most of his life, commemorates him. A Venn diagram is a schematic diagram used in logic theory to represent sets and their unions and intersections. Venn considered three discs R, S, and T as typical subsets of a set U. The intersections of these discs and their complements divide U into eight non-overlapping regions, the unions of which give 256 different Boolean combinations of the original sets R, S, and T.
The region of intersection of the three circles in the order-three Venn diagram, in the special case of the center of each being located at the intersection of the other two, is a geometric shape known as a Reuleaux triangle. Venn diagrams typically have three sets. Venn was keen to find “symmetrical figures…elegant in themselves” representing higher numbers of sets, and he devised a four set diagram using ellipses. He also gave a construction for Venn diagrams with any number of curves, where each successive curve is interleaved with previous curves, starting with the three-circle diagram. In 1963 D.W. Henderson showed that the existence of an n-Venn diagram with n-fold rotational symmetry implied that n was prime. In 2003 work by Griggs, Killian, and Savage showed that this condition is also sufficient. A. W. F. Edwards gave a construction to higher numbers of sets that features some symmetries. His construction is achieved by projecting the Venn diagram onto a sphere. Three sets can be easily represented by taking three hemispheres at right angles (x≥0, y≥0 and z≥0). A fourth set can be represented by taking a curve similar to the seam on a tennis ball which winds up and down around the equator. The resulting sets can then be projected back to the plane to produce “cogwheel” diagrams with increasing numbers of teeth. These diagrams were devised while designing a stained-glass]] window in memoriam to Venn. Edwards's Venn diagrams are topologically equivalent to diagrams devised by Branko Grünbaum which were based around intersecting polygons with increasing numbers of sides. They are also two-dimensional representations of hypercubes. Smith devised similar n-set diagrams using sine curves with equations y=sin(2ix)/2i, 0≤i≤n-2. Charles Lutwidge Dodgson (a.k.a. Lewis Carroll) devised a five set diagram. Venn diagrams are often used by teachers in the classroom as a graphic organizer, a mechanism to help students compare and contrast two or three “sets” of ideas. Characteristics of each set of ideas are listed in each section of the diagram, with shared characteristics listed in the overlapping sections. Simple Venn diagrams are introduced to students as early as kindergarten, and are used to help students organize their thoughts before writing about them. In Indian schools the basic Venn diagrams are taught using Indian rupee coins. Humans and penguins would be in the orange circle, in the part that does not overlap with the blue circle. Mosquitoes have six legs, and fly, so the point for mosquitoes would be in the part of the blue circle that does not overlap with the orange one. Things that do not have two legs and cannot fly (for example, whales and rattlesnakes) would all be represented by points outside both circles. Technically, the Venn diagram above can be interpreted as "the relationships of set A and set B that may have some (but not all) elements in common." The combined area of sets A and B is called the “union” of sets A and B. The union in this case contains all things that either have two legs, can fly, or both. The area in both A and B, where the two sets overlap, is defined as A∩B, that is, A intersected with B. The intersection of the two sets is not empty, because the circles overlap, i.e. there are creatures that are in both the orange and blue circles. Sometimes a rectangle, called the Universal set, is drawn around the Venn diagram to represent the space of all possible things under consideration. As mentioned above, a whale would be represented by a point that is not in the union, but is in the Universe (of living creatures, or of all things, depending on how one chose to define the Universe for a particular diagram). ↑ Ruskey, F., Venn Diagrams. Retrieved October 25, 2007. ↑ Weisstein, Eric W., Venn Diagram. Retrieved October 25, 2007. ↑ Henderson, D.W., "Venn diagrams for more than four classes," American Mathematical Monthly, 70, (1963), p. 424–426. ↑ Ruskey, Frank, Savage, Carla D., and Wagon, Stan, The Search for Simple Symmetric Venn Diagrams. Retrieved October 25, 2007. Cieutat, Victor J., Krimerman, Leonard I., and Elder S. Thomas. Traditional logic and the Venn diagram; a programed introduction. San Francisco: Chandler Pub. Co. 1969. McCarthy, J.F., and Krishnamoorthy, M.S. "Venn Diagram Construction of Internet Chatroom Conversations." Computer Science. (3975):535-541. 2006. Venn, John. "On the Diagrammatic and Mechanical Representation of Propositions and Reasonings." Dublin Philosophical Magazine and Journal of Science. volume 9, 59, 1880. p. 1-18. Bogomolny, Alexander. Venn Diagrams (Click). Dunham, William. Lewis Carroll's Logic Game. Johnston, Russell. Illustrating Formal Logic with Exclusion Diagrams. Rodgers, Peter. Applet for Drawing 3 Set Area-Proportional Venn Diagrams. Ruskey, F., and Weston, M. A Survey of Venn Diagrams. This page was last modified on 19 January 2016, at 21:25.